Fresno State announced today its plan to provide a clean, safe and healthy environment for the campus under a new California State University system-wide policy requiring all 23 campuses to become tobacco, smoke and vapor free beginning Sept. 1. 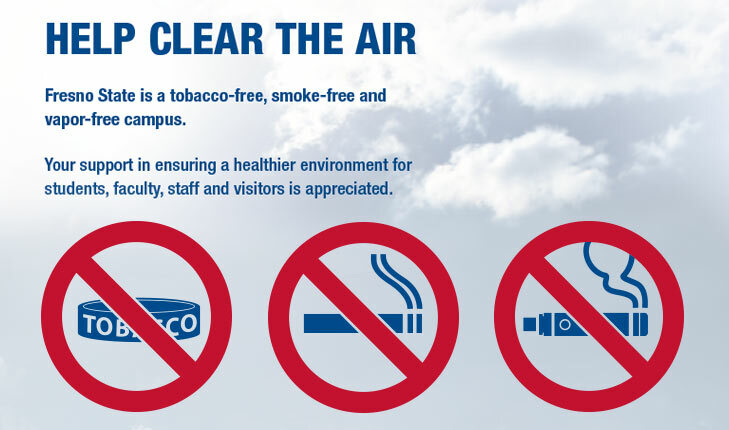 The University’s “Clear the Air” campaign will educate students, employees and campus visitors about the new policy adopted in the spring 2017 semester by the CSU Chancellor’s Office with Executive Order 1108. State law already bans smoking from workplaces and all buildings accessible to the general public throughout the state as well as within 20 feet of buildings. Title 5 of the California Code of Regulations authorizes universities to set and enforce smoking and tobacco policies. The new CSU policy, which will be in effect at all times, applies to all University property, including buildings, athletic venues, residence halls, parking lots, vehicles and grounds. This includes no smoking, vaping or tobacco use inside any personal vehicles located on Fresno State property. This restriction applies to tailgate gatherings and other outdoor, on-campus events. The new plan also removes 22 designated smoking areas that had been established under Fresno State’s previous smoking policy. 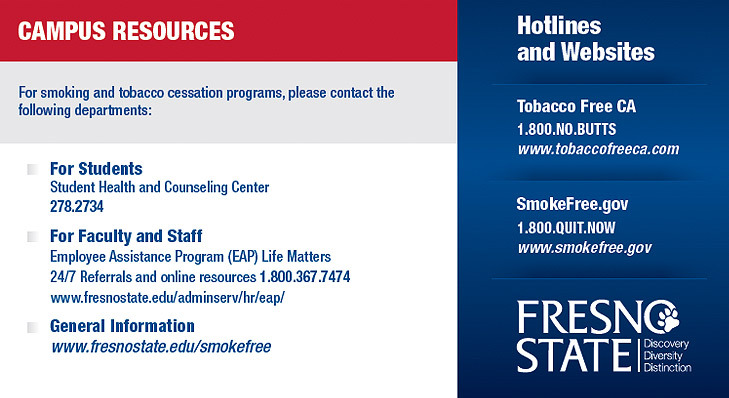 Fresno State offers cessation resources for students, faculty and staff at: http://www.fresnostate.edu/adminserv/smokefree/cessationprgs.html. To help support the implementation and communication of this new policy, University President Joseph I. Castro assembled a committee of 20-plus members including students, faculty and staff. The committee is led by Deborah Adishian-Astone, Fresno State vice president for administration. Adishian-Astone said the primary goal of the committee is to educate the campus community and public about the smoke-free policy. 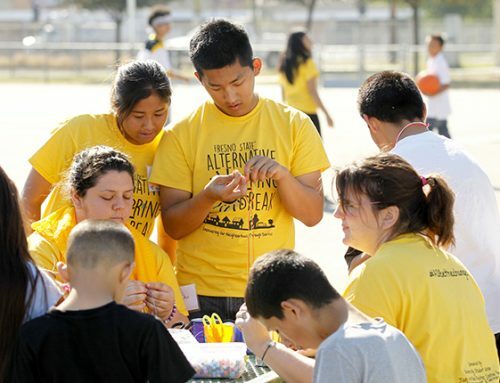 She said Fresno State campus and community members are asked to help create a smoke-, tobacco- and vapor-free environment using community reinforcement. For help with smoking and tobacco abuse, online resources and information are available at www.fresnostate.edu/smokefree. Students needing help can contact the Student Health and Counseling Center at 559.278.2734. Faculty and staff may contact the Employee Assistance Program Life Matters 24/7 Referrals at 1.800.367.7474as well as the online resources. For more information about Fresno State’s smoke-free programs, visit the websites for smoking cessation and counseling programs and the Fresno State Alcohol, Tobacco and Other Drug Safety Council.